One of the most exciting reasons to collect NFL rookie cards is that you get to watch their values spike if the players perform on the field. To help capture that excitement, Upper Deck launched a new website to help collectors track 2009 NFL rookie cards, but also make predictions on which rookie would have the best week at OwnTheRookies.com. Collectors who can successfully guess who will be Upper Deck’s “Rookie of the Week” will be entered into a drawing to win a box of 2009 NFL cards. 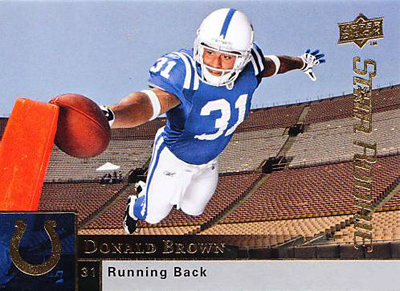 After helping the Colts move to 2-0 on Monday Night Football, Upper Deck has recognized Running Back Donald Brown with the honors of “Rookie of the Week”. If you entered codes from Brown’s cards last week, stay tuned to the website to see if you are a winner! Coming off of the 2008 season, the Colts were not ready to go into 2009 without a backup plan in case of injury to star running back Joseph Addai. Addai spent four games of the season on the shelf with various injuries, and playing at less than 100% often enough when he was healthy enough to play. Although the Colts were able to put together a good record, their lack of a rushing game without Addai was a problem they did not want to deal with again. Donald Brown was drafted in the first round because of his play at University of Connecticut, mainly to fill a backup role behind Addai. They figured he could also be used as a change of pace back when their lightning fast star needed a break. He impressed collectors out of the gate with his potential, and was immediately near the top of the class in value for the running backs that were selected. Despite the fact that he didn’t have the same kind of college following as players like Knowshon Moreno of Georgia or Beanie Wells of Ohio State, his talent was undeniable. Brown wasn’t used much in the preseason (mainly due to the physicality of the position), but still managed to score a touchdown against Detroit and put up a big run against top run stoppers in Minnesota. During the first regular season game, Brown looked great in his time on the field, putting up 50+ total yards behind Addai in a Colts win. Last night, Brown’s carries dropped from eleven to six because the team was playing from behind during the second half, but he made the most of the reps he received. He averaged 6.5 yards per carry and became the first rookie back to score a rushing touchdown in 2009 en route to a come from behind win over the Dolphins. His touchdown tied the game late, and another catch was made later on a key play for a first down. He came away in week two again with over 50 total yards, and Colts collectors should be very happy to have him on the team to complement the revitalized Addai. Brown has already had some pretty amazing cards hit the market, with autographs and rookie cards in every Upper Deck product so far this year. My personal favorite has been his Premier Rookie Auto Jersey out of 2009 Upper Deck, as it is the first UD card of the year to feature a certified autograph and player worn Colts jersey swatches. The card is also limited only to 40 copies, making it not only valuable, but rare as well. The design is absolutely stunning, and has already has collectors fighting for a chance to get one. His base rookie card, also out of Upper Deck football, has one of the coolest action shots of the year as its subject. It features Brown diving for the goal line pylon while almost breaking through the front of the card. Many collectors love the base Upper Deck rookie set because of the amazing photography, and this card does not fall short in any sense of the word. Lastly, Browns autographed parallel out of Upper Deck Heroes football is a great one to pick up in addition to the others. It features a hard signed autograph, as well as a cool design that features a game photo from Brown’s time as a UConn Husky. It is serially numbered to 199 copies, and should be an affordable option for collectors who don’t want to break the bank, but still want an amazing card. Donald Brown definitely has the talent as well as the supporting cast to have a great career for the Colts, especially if he is going to be tag-teaming with Joseph Addai. As the NFL moves to a two back rotation for every team, Brown’s importance and involvement will grow along with his value in the hobby. His cards haven’t reached their pinnacle yet, which is great for people who want to get in at the ground level. He also has the luxury of playing for one of the best teams in the league, so his growing pains from the NCAA to the NFL should be minimal. He has already been a vital part of one of the team’s two wins, and that will only get to be more important as the season moves on. Miami and Jacksonville are not bad teams either, thus proving that he has the skills to go toe-to-toe with the better teams of the league. Check in next week for the newest rookie to win top honors of the week, and don’t forget to enter in all your rookie card codes from the Upper Deck products you have collected so far. Not only can you win prizes, but the site has some great features to allow you to track rookies and their cards this season!